Well, well, well. This is just great. A very generous person just dropped me a note today to say that in iOS 10 it's very easy to convert an email to a PDF. From the standard message print screen pinch out to open the message in a new window. 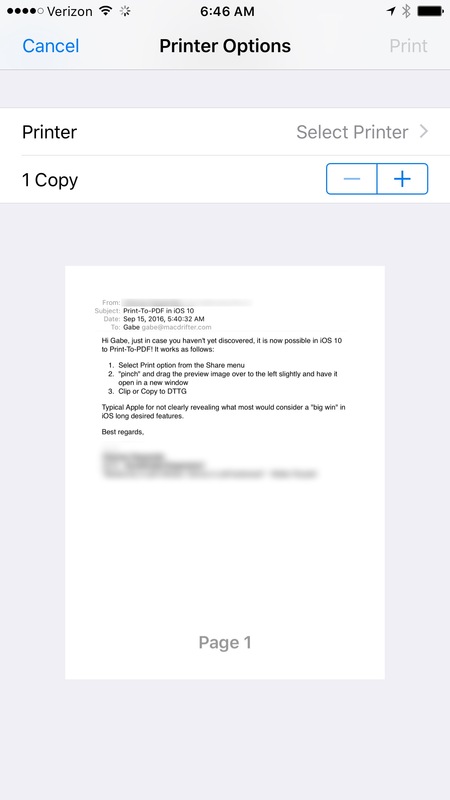 Now use the share sheet to send the PDF to another app. Apparently this has been available since iOS 9 in some form or another. I still wish we could share the entire message as an "eml" or similar self contained file along with all attachments, but I'll take a PDF if I can get it. This is perfect for DEVONthink To Go and OmniFocus.